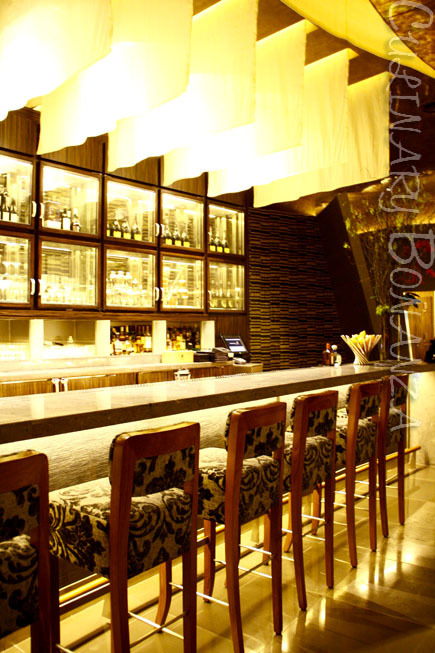 It was such a privilege to watch Waku Ghin's internationally acclaimed bartenders mixing libations right in its bar and lounge at Marina Bay Sands Singapore. At Waku Ghin, the patrons are not just treated to its selection of world-class cocktails, but also to fresh and meticulously prepared bar nibbles. 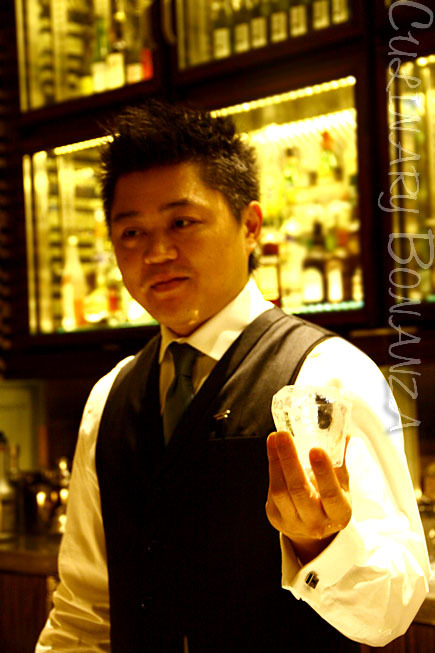 Upon entering the front lounge area of Waku Ghin, we soon settled ourselves at the plush bar stools, all ready to witness two world class bartenders chisel their ways with their deft hand-craftsmen in quickly carving those lower-than-freezing-point blocks of solid into precisely shaped diamond, square or iceballs. The most challenging feat was carving the iceball, which requires not less than 2 days and repeated chiseling process to get the perfect sphere. So much trouble and pain just for the ice? Not many may know that ice is actually a quintessential component and secret to a great glass of cocktail. Wrong choice of ice may result in over-concentrated or over-diluted cocktail or the drink may simply be at the wrong temperature. As a rule of thumb: The greater the surface area of the ice, the faster is the melting-rate, and hence, the dilution rate of your drink. It has a quick melting property and thus is perfect for concentrated, strong or fizzy drinks that has to be served supremely chilled and watered down quickly in the right amount, for instant serving. Perfect example is mojito or mint juleps. Besides, crushed ice is also ideal to prepare frozen, blended drinks like magarita or daiquiri. 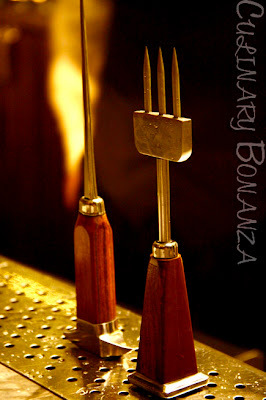 It is most probably used for drinks served in tall glass (long drinks). It adds the aesthetic side for drinks served up in a rocks glass. It is shorter than the diamond, so I reckon it is used for preparing shaken and stirred drinks or even for cocktails served on the rocks which are strained prior to serving. 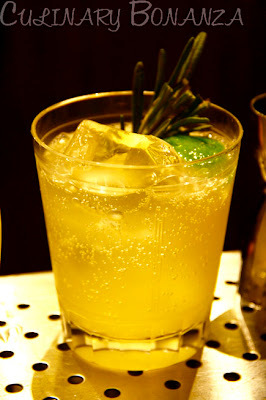 The slow meting rate of iceball is the reason why it is most commonly used when serving high-end cocktails or fine spirits like whiskey that are served and savoured slowly. Apparently, the water purity and chilling rate will also affect the resulting ice blocks. 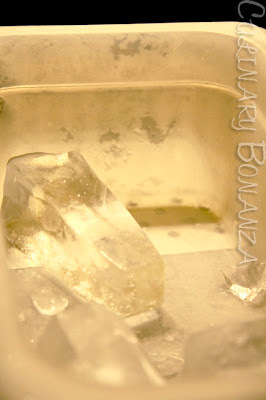 Pure water and slow chilling will result in clear, perfectly see-through ice blocks. The cloudiness we observe in the ice cubes made in our fridge at home is because of gases trapped inside. And since the ice trays cool it quickly, the air didn't manage to escape before the surface is frozen. While I think these air bubbles may not be paramount to the cocktail's taste, it somehow, affects the aesthetics of the drink. Just think of it like diamonds, the clearer it is, the better and more pleasant it looks to our eyes, right? w Martini - Beefeater London Dry Gin & Noilly Pratt. The martini was served with baby peach soaked in truffle oil. This taste much better than olives! 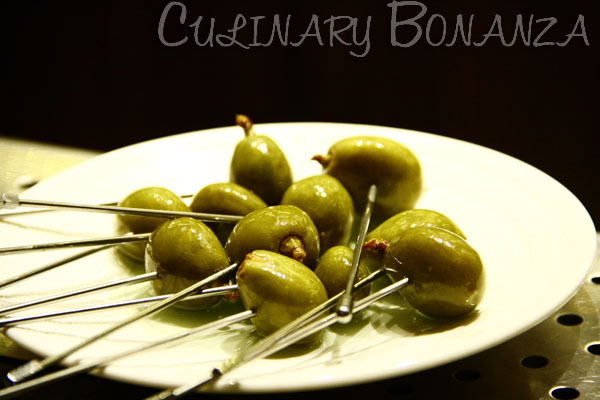 Its pickle-like crunchiness and taste are quite a pleasant twist from the conventional olives that cocktail connoisseurs are used to. 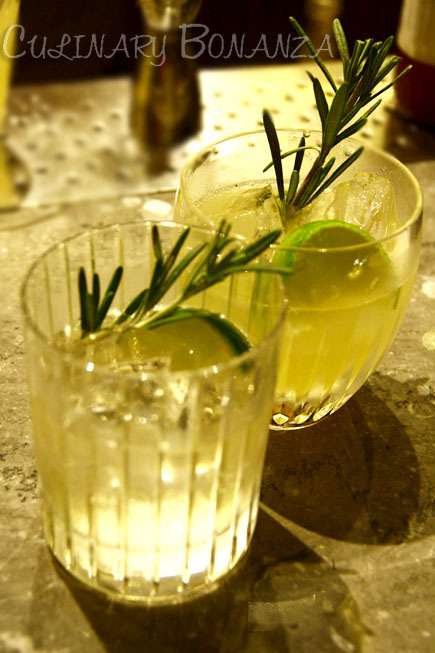 w Gimlet - Gordon's Gin, lime juice and sugar syrup. Simple, but sleek and an unforgettable concoction, that makes a great aperitif drink. This is my favourite, which is also Chef Tetsuya's all-time-favourite. 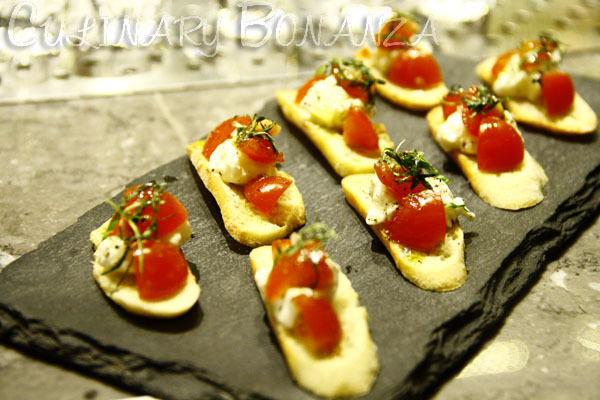 w Bruschetta - pretty standard, very crispy bread base. 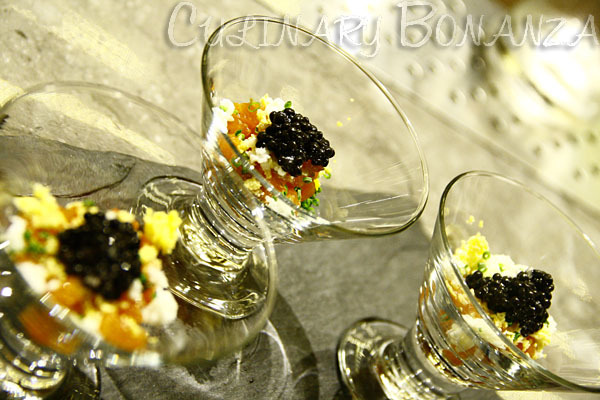 w Ocean Trout Tartar with Snow Eggs and Beluga Caviar - as a non-seafood fan, unfortunately I couldn't thoroughly appreciate the beauty of this dish. My friend, however indulged in each scoop of this beautiful seafood treat. If it's any consolation, the colour composition looks lovely to the eyes, with the black pearls (beluga caviar) popping out in the centre, distinguishing itself from the myriad of colours in the background. If only they were sweet and juicy blackberries... (*sigh) When the first scooped entered my mouth, it was not that unpleasant after all. I apologize for my crass inability to appreciate seafood, but it tasted like semi-salty mushy and soft mixture in my mouth. Alas, I still tried to finish until the very last scoop. w New Zealand Scampi in Sea Water and Lemon Scented Olive Oil - I can't believe I actually would ever eat raw prawn! (eek!) Not that it tasted distasteful, I tried to trick my mind into thinking that the slimy and slippery sensation in my mouth were caused by the olive oil. 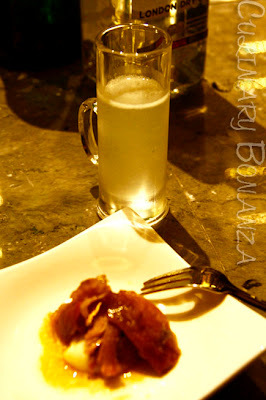 w Duck Confit with Potato Puree - It was easily the most divine duck meat I have ever eaten in my life! It defied all the stigmas I had always associated duck meat with. The tender meat felt as if it melted in my mouth, yet still crunchy on the top layer. My only regret was it was served in nibble portion. 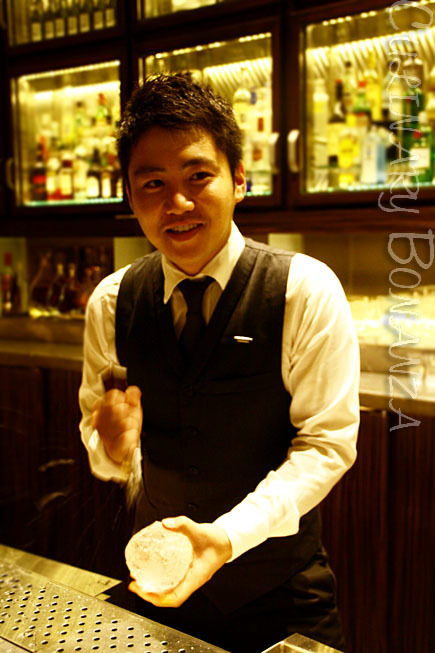 w Akihiro Eguchi - Singapore Champion of Diageo Reserve World Class Competitionin in 2011 and 2012; represented Singapore in1 the Global Final Diageo Reserve World Class 2012 in Rio de Janeiro, Brazil.